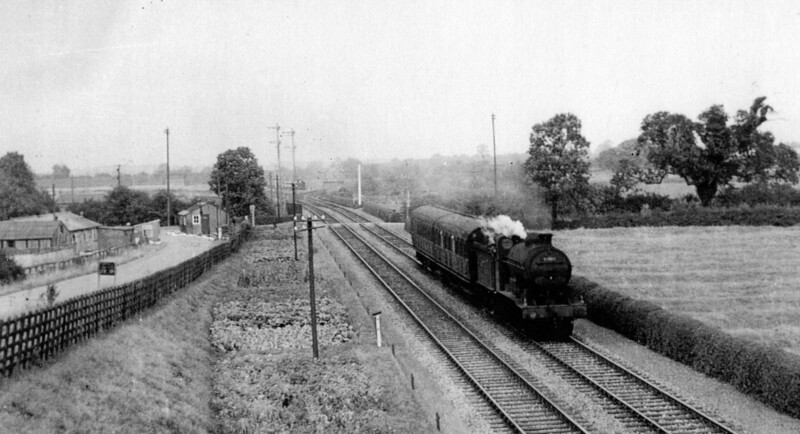 Steam train at Orston Lane level crossing: showing a steam train heading south across Orston Lane level crossing, with the former army camp on the right (west of the NS track). Photographs 1960-1980 showing building projects by Mr Greasley’s company, including the convertion of the Old Rectory into retirement apartments. There are also pictures of Mr Greasley meeting Mrs Margaret Thatcher, and a splendid picture of a train on the N-S railway passing the former army camp located on Orston Lane, Bottesford. Identity of photographer/s not known: pictures of Mr Greasley with the Prime Minister and that of the railway train may have been by press photographers.